I don’t think these need a big setup. They pretty much speak for themselves. Say hello to the classic holiday favorite, miniaturized. Bite-sized, in fact. Well, if you’re me, that is. If you’re a regular person with regular table manners, perhaps it’d take two or three bites. 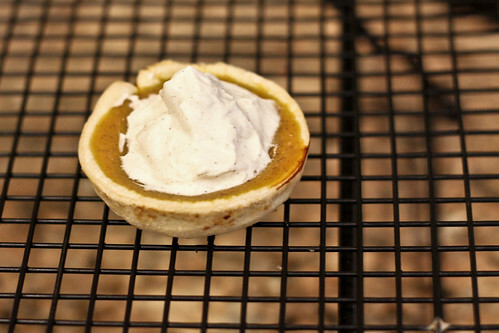 These little tarts are the perfect portion size for Thanksgiving, dinner parties, or simply for the knife-averse. No pie-dividing necessary! And bonus? They do nothing but reinforce the idea that yes, if it’s adorable, it just tastes better. 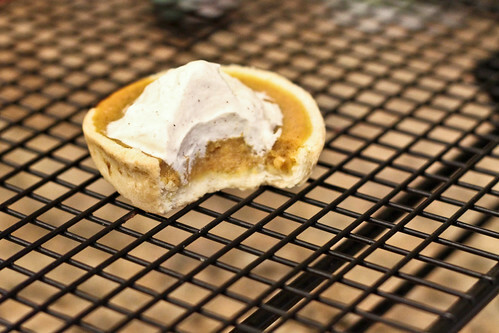 These delightful and, needless to say, adorable individually-sized pumpkin pies are accented with just the right amount of sweetness. Top them with decadent homemade cinnamon whipped cream for dessert or a party dish that’s guaranteed to please! 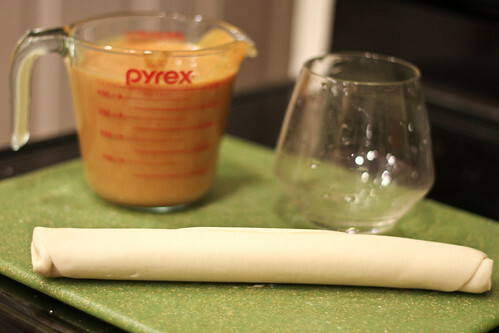 – 1 box refrigerated pie dough (the kind that comes with 2 in the box), or your favorite dough recipe. 1. 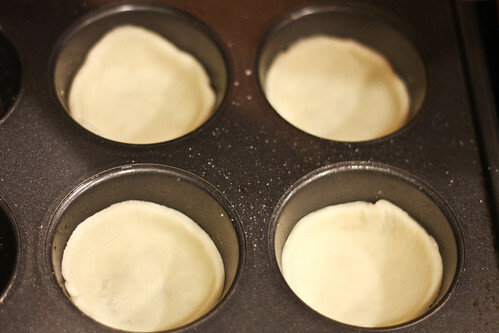 Preheat oven to 400 degrees F. Roll out your pie dough, then cut out small circles of dough. 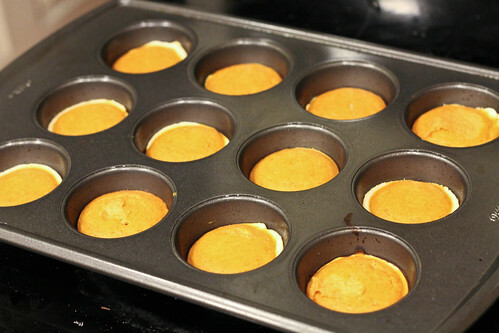 Press them into a non-stick sprayed muffin/cupcake pan. 3. 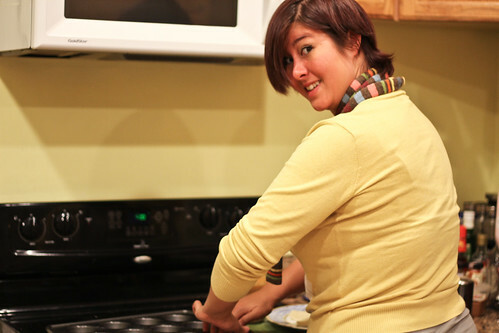 Bake in the oven at 400 degrees for 10 minutes, then reduce heat to 350 degrees and bake for an additional 10 minutes. 4. 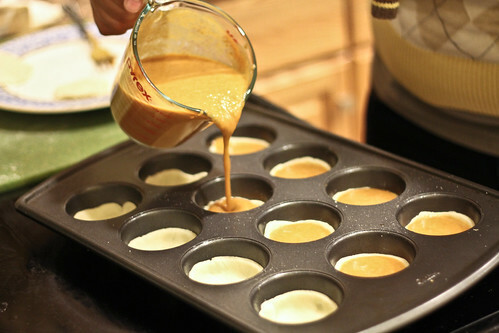 Allow tarts to cool completely, or refrigerate until ready to serve. Top with whipped cream! 1. 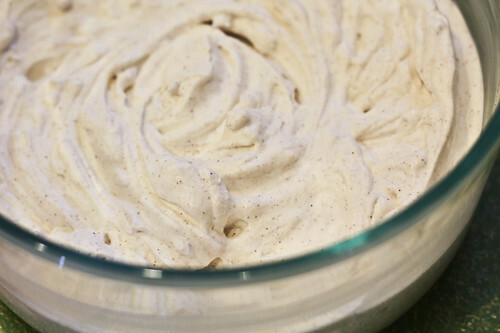 In a chilled bowl, whip together cream, sugar, and ground cinnamon, about 2 minutes or until firm peaks begin to form. Do not overwhip! 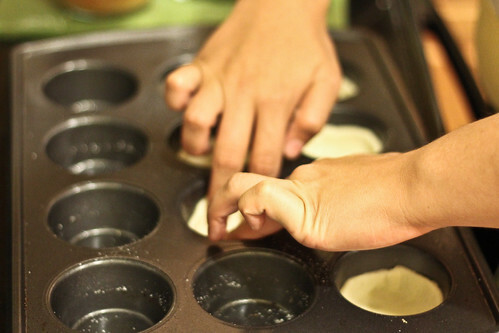 I used an electric hand mixer, but you can do it by hand using a whisk, or use a standing mixer instead. I like my pumpkin pie cold, which makes it even easier because I can make these the night before and refrigerate them until it’s time to consume! Make them now, thank me later. Hmm, you’re right, I suppose I should reserve using the word “sweet” even when I mean it like “nice, adorable, cute” in recipes, because when talking about food it will always only mean sweet-tasting. Right 🙂 “Just the right amount of sweetness” is the perfect description. Anyway, for those thinking of making these, make them. They are tasty, and people will like you. That’s a mini muffin pan right? Also, did you spray the pan with Pam or anything? Thanks so much:-) Lovvvvveeee your blog! Keep up the great work. So to answer your questions, no it’s just a regular muffin pan, like you would make regular cupcakes in. And I did spray the pan with nonstick spray beforehand. I should add that to the instructions above, thanks for the reminder! Mini desserts are just so adorable, don’t you think? “how many pieces can I eat without looking like a pig?”. Immortalized on my Pinterest, where I will literally only pin recipes suitable for cooks with severe ADHD and no food processor. These look divine! Can’t wait to give them a try! Gretchen, I love it!! I am in charge of making pumpkin pie this year to bring to my parents’ house. I’m making it vegan (shhhhh!!!! 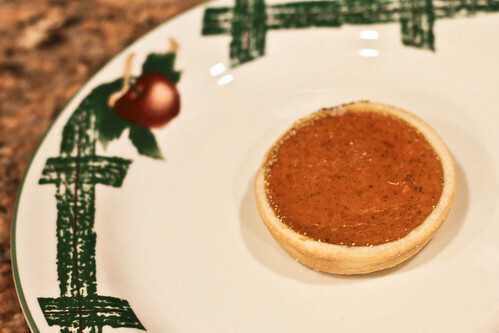 ), but also really love the idea of doing the little single-serve tarts!! 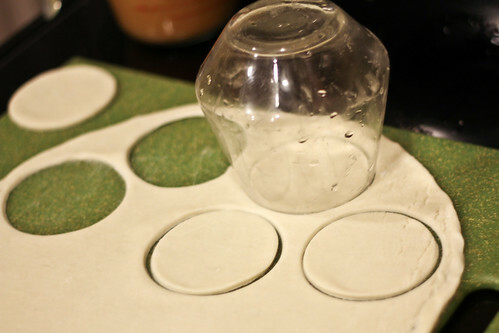 And, I’m glad that you used a pre-made pie crust (and LOOOOVE your contraption for cutting perfect circles!! )- I am not even going to ATTEMPT a homemade crust- I know that it would end up being uneven or burnt or just taste like sh*t in general. Good timing on this post- love it!! Thanks for the great idea to make tart size, they are perfect! Just made some last night with the kids and they had a blast. Put in fridge and will make the topping tomorrow morning. Hubby did sneak one and loved them! Yay! I’m glad they’ve turned out well, and that you kids had fun doing them too!! So, Gretchen, darling. I’ve made these and posted them on my blog, too (just the link to you, not cribbing the recipe), but!! 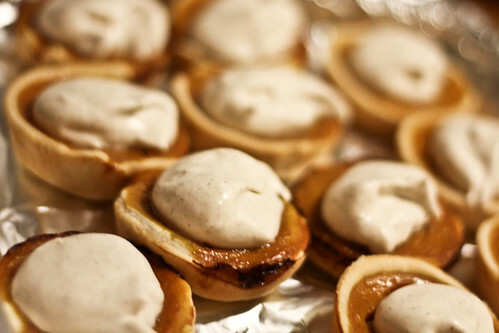 I was excited to see your recipe for mini pumpkin pies but decided to make them even more exciting (if possible) for the kiddos. I decorated them as turkeys and they were a BIG hit at my 3 year old’s class party. My 6 year old was excited as well!!! They were super cute. I would post a pic but can’t do so here. EXTRA PIE FILLING…I had tons of batter left over since I could only gather up 30 pie shells from the 2 ready made pie dough. However, I did find a great little recipe online for the left over pumpkin batter from The Rescue Baker. We made yummy pumpkin muffins. They probably could use some tweaking but we like ours being not-so-sweet. They are great for breakfast! Thanks for the tip Deanna! Decorated as turkeys sounds SO cute! 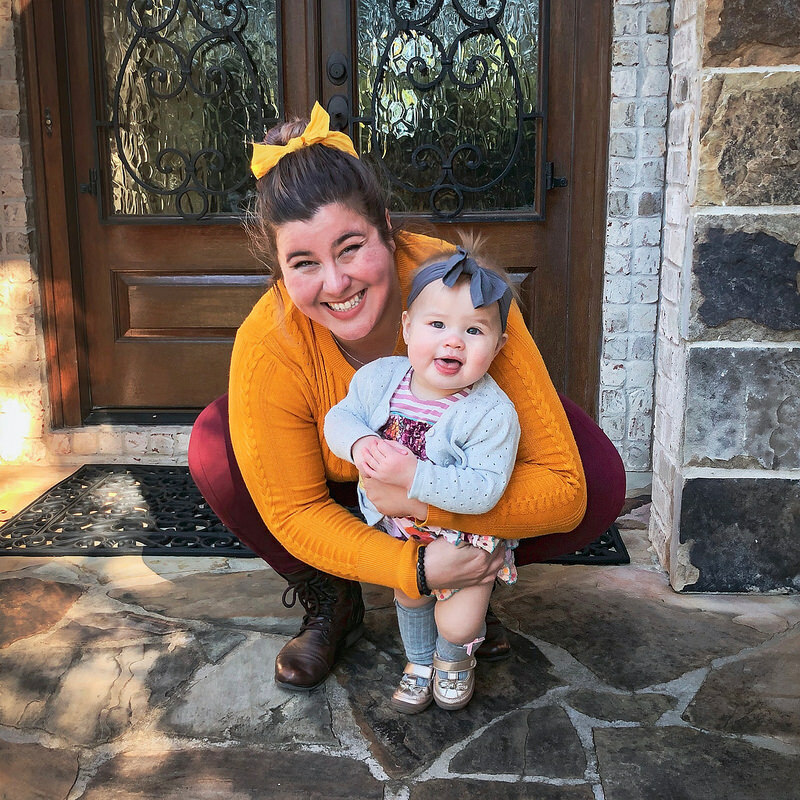 How did you doll them up? I’d love to know. And yeah, I know that extra pie filling is kind of a hazard, since there’s a much higher crust to pie ratio, but that’s a great idea for pumpkin muffins! I think that sounds perfect as a post-Thanksgiving brunch dish! With lots of candy corns and edible eyes. I used 5 yellow & orange candy corns on top as the feathers and two Wilton black & white candy eyes. I cut the yellow portion off of a candy corn and used as the nose. Then I found red and brown candy corns to use as the wattle. I cut the brown part off and just used the red. The only thing I need to rethink is how to affix the candy. I used decorator’s icing to hold on the candy but the oils in the pumpkin pie made some of the icing run. Strange but only on almost half of them. Not sure how I will fix that next time but I am totally taking them to Grandma’s for a Thanksgiving with 8 children under age 7! !